When the weather gets hot and toasty, cooling off in a swimming hole can be a huge relief. Some of the top Central Texas swimming spots are hidden and hard to find. Others are more accessible, but they may draw more crowds from May to August. 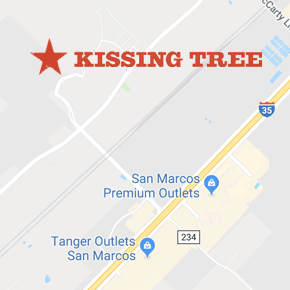 No matter what your mobility or activity level, you can find a great place to refresh that’s not far from Kissing Tree. This natural-bottom pool combines accessibility with rustic appeal. In the heart of Zilker Park in Austin, Barton Springs Pool is 1,000 feet long and easy to get to. Because it’s fed by a natural spring, the water doesn’t get warmer than 70 degrees, which can feel chilly on a hot day. Some of the access points offer stairs to help you ease into the water, and you can dry off in the shade on a grassy hill. Get there early in the summer because the parking lot can fill up quickly. Helpful hint: those who are worried about stepping on a rock or algae may want to wear water shoes. Blue Hole, in Georgetown, is a swimming hole with a relaxing waterfall. The trail along the water is wheelchair accessible and a wonderful place to stroll. Park benches and picnic tables give you a chance to take a load off if you forget to bring beach chairs. This is an ideal place to bring the grandkids. Just be careful on the rocks, which can get slippery when they’re wet. Also, the lack of shade makes it feel hot if you’re not wading in the water on a warm day. For a straightforward swimming experience in a man-made pool head to Deep Eddy, the oldest public pool in Texas. Located in Austin, this swimming spot is popular in the summer. Although the stairs to get down to the pool area are steep, the zero-entry pool offers easy access. You can swim laps in the lane that’s separated from the rest of the pool with a concrete wall, or hang out in the shallow area to soak up some sun. The non-chlorinated water is pumped in from a spring. One of the most infamous swimming spots in Central Texas, Hamilton Pool is a collapsed grotto that looks like a wonderland. Waterfalls and rock formations create a unique atmosphere. After hiking the 0.25-mile trail to the water, you can swim in the cool spring or hang out in the cave behind the waterfall. Check out the Travis County Parks website if you want to swim here. You must make a reservation before you go, and the park may close the swimming area if recent weather leads to an abundance of microbes in the water. In New Braunfels, Comal River is a mecca for tubers. If you’re looking for an adventure that goes beyond lounging on the shore, try tubing on the Comal. A 20-second chute sends you into the river with a little bit of adrenaline. After you go through a couple of small rapids, it’s smooth sailing.